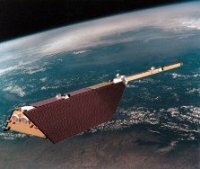 The GFZ CHAMP (CHAllenging Mini-satellite Payload) low earth orbit satellite, mainly designed and operated by different German companies and institutions has been launched in July 2000. CHAMP is providing for the first time simultaneously highly precise gravity and magnetic field measurements over a 8 years period. This allows the tracing of spatial and time variations of both fields for a long time. The provision of regularly radio occultation measurements of the atmosphere and ionosphere are used in a pre-operational phase for weather prediction and space weather monitoring purposes.